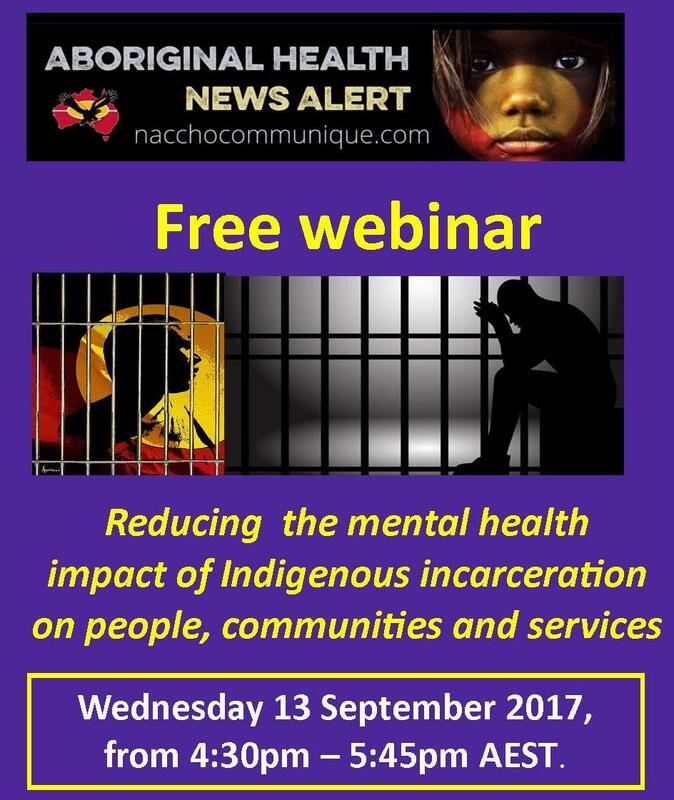 ” Our CEO Pat Turner and NACCHO staff would like to invite all health workers to be a part of this free webinar: Reducing the mental health impact of Indigenous incarceration on people, communities and services. No need to travel to benefit from this free PD opportunity. Simply register and log in to participate from your home, work or anywhere you have a computer or tablet with a high speed internet connection. Wednesday 13 September 2017, from 4:30pm – 5:45pm AEST. NACCHO also invites all Member services to ask staff to register now to access a free Mental Health Professionals’ Network webinar for their own professional development. The Indigenous interdisciplinary panel will explore and discuss ways of reducing the mental health impact of Indigenous incarceration on people, communities and services. This professional development opportunity is free and the previous webinar conducted by the MHPN had 680 participants across Australia. The webinar features a Q&A with a panel of experts and will explore the key issues and the impact that incarceration has on Aboriginal and Torres Strait Islander peoples. The panel will discuss strategies to enhance cultural awareness and develop responsive services for Indigenous communities affected by incarceration. Facilitator: Dr Mary Emeleus (QLD-based general practitioner and psychotherapist). Registrations close at midnight on Tuesday 12th September, 2017. Please find attached a flyer about the updated webinar and it would be appreciate if you could distribute this to your local network.